Sensitive, compact, comfortable and easy going. 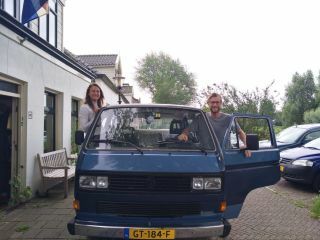 Oerde gelijk Westfalia California with 130 hp diesel engine TDI, is therefore well in traffic. Tolweg beneficial by its limited height with its folded up roof. Easy maneuverable and parking in urban areas. With her 17 years old, this classic is at age, but still loves adventure trips. If you are good to her, she will not let you down too soon. In recent months she has had a lot of maintenance, such as a new curtain roof, new air conditioning, new diesel boiler, AGM batteries and the necessary maintenance. She is looking forward to a next adventure trip. The navigation has been updated and is as current as possible. With the navigation you can also search campsites. Of course, NKC's camping guides are also included. Through the awning it is sheltered from sun and rain heerljk sitting outside. In case of cold, the diesel heater can be used independently of the engine to warm the comfort. Biking is not a problem. Original bicycle carrier on the valve for 2 bikes. Or, if desired, a Twinnyload bicycle carrier can be placed on the towbar. Under the roof deck there is sleeping accommodation for 2 people, and there is also a drop-out protection for children. Downstairs, the sofa can easily be converted into a sleeping area for 2 people. Bed length can be adjusted which also makes it suitable for longer persons. Food can be stored on the road and at the campsite in the refrigerator which can also be set at freezing temperature. A two-point gas set is available for preparing food. The kitchen is also equipped with a tap with running water. Nespresso machine is available for delicious coffee. Via USB or Bluetooth, a dedicated music source can be connected to the DAB + autoradio. 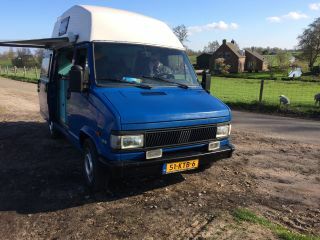 Winter tires are mounted in the period October to March, so in this period, camper also has access to Germany and France. A bustent is also available. 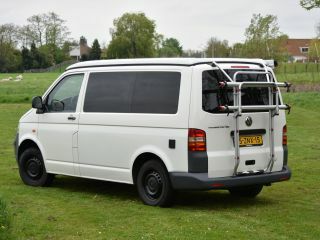 (Never used) Bustent's idea is that it provides extra space and can be easily linked by camper while making trips. Guides for the car and camper area are provided. The camper is as extensive as possible with NKC. So in case of unreparable damage or defect, replacement transport (camper) is arranged. International shelter assistance is also ensured so that the tenant can enjoy maximum and carefree holiday with Merian. If there are additional wishes then I would like to hear that. In less busy periods soups go with pick up and bring times. If you miss any information, I would like to hear it.